A classified document written and distributed by the Israeli Foreign Ministry after the historic summit between US President Donald Trump and North Korean leader Kim Jong Un in Singapore reportedly raises skepticism about the result of the talks and concern over several concessions made by the US president. 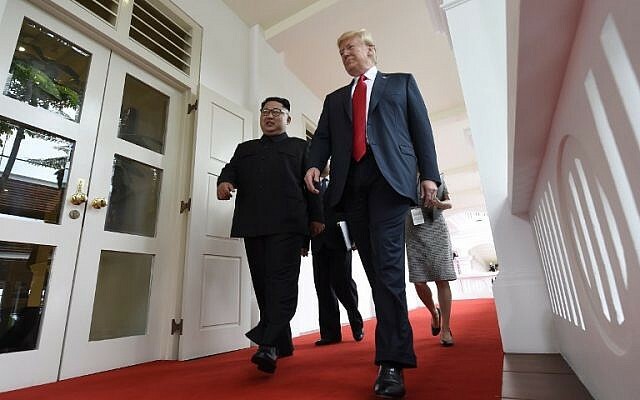 “Regardless of the smiles in the summit, many in Japan, South Korea and the US Congress doubt that North Korea is sincere in its intentions,” the document said, Channel 10 reported Thursday. Despite Israeli officials, including Prime Minister Benjamin Netanyahu, praising the summit as an “important step” in denuclearizing North Korea, the reported document said there were “significant gaps” between the United States’ tough stances before the meeting and parts of the agreement signed Tuesday by Trump and Kim. The document was said to have been sent Wednesday to Israeli diplomatic missions around the world, as well as to senior Foreign Ministry officials and the Prime Minister’s Office. “Our assessment is that regardless of President Trump’s statements about quick changes that are expected in North Korean policy, the road to real and substantive change, if it ever happens, will be long and slow,” the ministry’s researchers wrote, according to Axios. “There are significant gaps between the American declarations before the summit regarding the need for a ‘complete, verifiable and irreversible denuclearization,’ and the joint statement’s language which only included a ‘complete denuclearization’ of North Korea,” the document continued. Another Trump concession pointed out in the reported document was his commitment to halt joint military drills with South Korea, in exchange for China stopping joint exercises with North Korea — an arrangement said to have been opposed by the US before the summit. Netanyahu on Tuesday hailed the summit, linking it to the US leader’s “tough stance” on Iran. “President Trump also takes a tough stance against Iran’s attempt to arm itself with nuclear weapons, as well as against its aggression in the Middle East. This is leaving its mark on the Iranian economy,” he continued, referring to Trump’s withdrawal from the landmark 2015 pact last month. 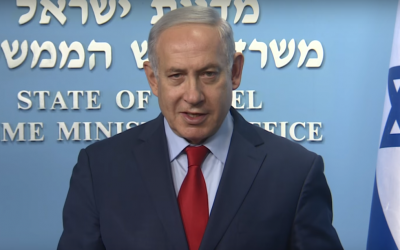 “Trump’s policy is an important development for Israel, the region and the entire world,” Netanyahu added. Trump and Kim held the unprecedented meeting in Singapore, after which they signed a joint document praised by both leaders. The summit — unthinkable only months ago — comes after the two nuclear-armed foes appeared on the verge of conflict late last year as their leaders slung personal insults at each other and North Korea conducted nuclear and missile tests.